Skin: [UMEBOSHI] Ellie skin 3 -Angel- Tone 1 Light Brow @The Seasons Story NEW! Eyes: NINI:3 Meggy Eyeball black @The Chapter Four NEW! Hair: [RA] Mia Hair @Hairology NEW! Corsage: tomoto, tumami*nanten corsage green/blue @The Seasons Story NEW! Shawl: tomoto, fur shawl F FATpack @The Seasons Story NEW! + Black Cat: 1 [[RH]] Black cat set BOX [RARE] @The Seasons Story NEW! + Foods: 2 [[RH]] Nabe set BOX [RARE] @The Seasons Story NEW! + Heater: 5 [[RH]] Heater @The Seasons Story NEW! + Rattan Basket and Cat: 6 [[RH]] Chiigura set (Red) BOX @The Seasons Story NEW! + Rattan Basket and Cat: [[RH]] Cat (Black) CHIGURA @The Seasons Story NEW! + Table: 4 [[RH]] ZATAKU (wood) @The Seasons Story NEW! + Cushion: 17 [[RH]] ZABUTON B (sit) @The Seasons Story NEW! + Cushion: 18 [[RH]] ZABUTON C (sit) @The Seasons Story NEW! + Cushion: 19 [[RH]] ZABUTON D (sit) @The Seasons Story NEW! 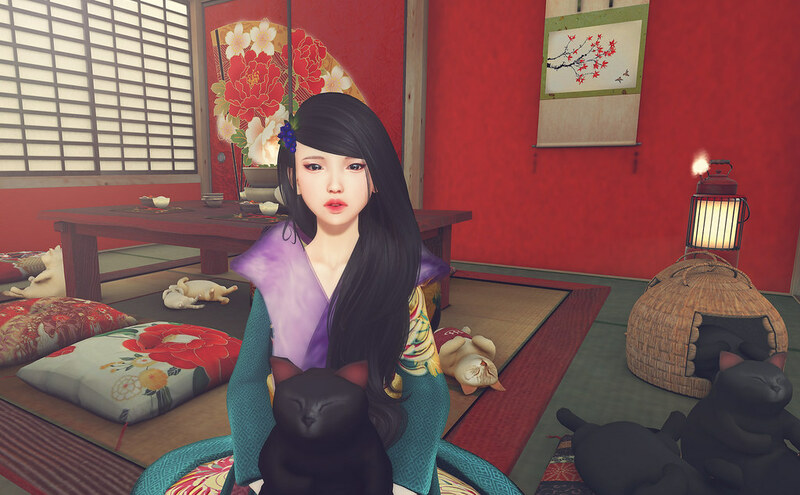 + Cat (Red): 8 [[RH]] Cat (Red) ONSEN @The Seasons Story NEW! + Kitty (Red): 15 [[RH]] Kitty (Red) @The Seasons Story NEW! + Kitty (Gray): 15 [[RH]] Kitty (Gray) @The Seasons Story NEW! + Cat: 10 [[RH]] Cat Sit @The Seasons Story NEW!